I came to the Monsoon’s around 5 pm on a Friday evening. Oddly enough, my friends and I were the only ones in the restaurant for the entire duration of our meal. Monsoon’s has a very posh design, with black, leather padded seating (sofas and singular seats) creating an overall comfortable, classy environment. There is no one to seat you when you walk in, so you can sit anywhere you would like. The restaurant is fairly large, with a very spacious bar if you’re only interested in going for a few drinks. If you enjoy martinis then I am certain you will be in Wonderland when you look at the drink menu. Monsoon’s has 101 martinis – it was so difficult to choose only one! The martinis range from a variety of sugary sweetness to strongly liquored, as well as appeal to the sci-fi lovers and the girly-girls. Monsoon’s has surely covered all of their bases where martinis are concerned. Searching through the never-ending drink menu, I finally decided on a Butterfly Martini – a blue-green concoction that appealed to my sweet tooth and made my taste buds soar. Our waiter for the evening was very attentive, friendly, and quick with our drink orders. He was also helpful in suggesting the best of Monsoon’s martinis. Being a very picky vegetarian, it is difficult to find food that I actually enjoy, but Monsoon’s greatly impressed me. The menu is centered on rolls, sushi, and sashimi, but there are many options available. I ordered a Japanese Garden Salad, which consisted of organic greens, cucumbers, carrots, and was dressed with a sesame-ginger vinaigrette. My friend and I also shared Thai Lettuce Wraps – leaves of lettuce topped with carrots, cucumbers, sprouts, and mint, with a peanut sauce to complete. The meal was absolutely stupendous. Another friend of mine ordered Yam Rolls and Sake Sushi (Atlantic salmon rolled with rice and vegetables). We were all very pleased with the quality of the food and the delicious taste. The prices vary from around $6 to $13 depending on the meal you purchase. The portions are large, so make sure you visit with a big appetite. The only downside was that the food took a while to prepare, even though we were the only ones in the restaurant. You are given chop-sticks to eat with – a hard feat for beginners, but it is a simple skill that takes only a few moments to master. If you are unable to use chop-sticks, however, forks can be provided. Other than the long wait, we were full to the brim and very satisfied. I inquired about the nightlife, and the waiter informed me that Monsoon’s is a popular venue on Friday and Saturday nights for customers looking for a classy pre-drink before they hit the town. Monsoon’s is a perfect lounge area to gather with friends, and also hear live music on certain nights. 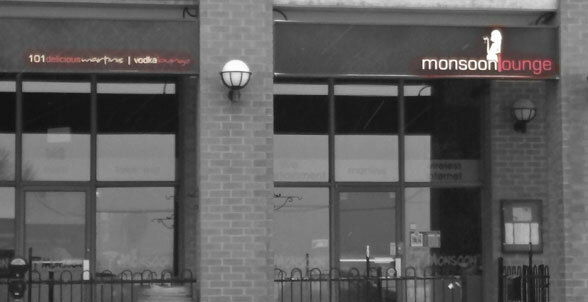 Located at 140 Dunlop Street East, just past Manhattan’s, Monsoon’s is closed on Sunday and Monday, but opens at 4pm every other day of the week. It’s a little hard to spot, so make sure you are paying attention while driving by. If you’re ever in the mood for an affordable and delectable meal I suggest you try out Monsoon’s – you will not be disappointed.